Kevin Kerrigan, PVC Enterprise and SBS, introduced the work that has started on the Hallam Model which is part of the stategic step change work . 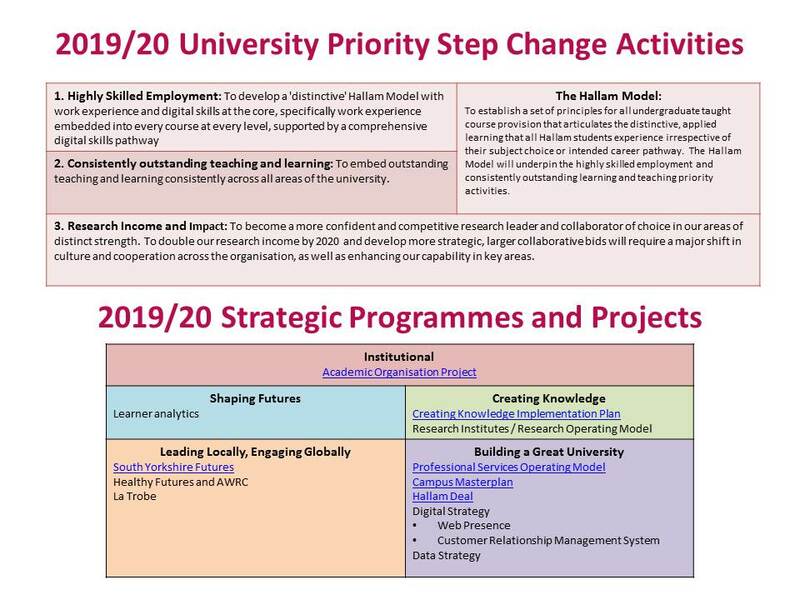 The project will establish a set of principles that articulates the distinctive, applied learning that all Hallam students experience irrespective of their subject choice or intended career pathway. The project has identified six principles to initiate discussion and consideration. These are listed along with more detail in the Board paper. Principle one, three and part of five will be delivered through the Highly Skilled Employment project with the remainder open for interpretation, change and challenge through working with project stakeholders. The Board provided significant and useful comment, including the Students Union giving their support for every element of the project. This will be fed back to the project working group and ULT lead, Roger Eccleston, PVC Research and Global Engagement. The Hallam Model will be a standing agenda item at Shaping Futures Board providing opportunity for further discussion to support progress. Extensive stakeholder activity will take place to discuss the principles and to understand what makes Hallam distinctive. Following on from January’s update, the Staff Handbook is now available. The Handbook has been contributed to by Assistant Deans for Student Experience (ADSEs), Professional Services stakeholders and the Academic Quality and Standards (AQS) team. The HSE blogsite will continue to be updated with relevant information for this ongoing project. Working with the Student Marketing team the 2020 UG Prospectus has been updated to articulate the HSE offer, as well as work being undertaken to ensure top line principles are included in open day information, such as the next UG course open day on 9 March. The paper will be considered at Faculty Shaping Future Boards and Department Leadership Teams. Jacqueline Stevenson, Head of Research (SIE) and lead for BAME, presented a paper outlining the completed activity that had taken place in Semester One of 2018-19 and the current/planned activity of Semester Two . The project team are currently meeting with all Heads of Departments and other relevant stakeholders to confirm data, discuss what activities each department is engaged in, what training, evaluation or operational support would be helpful and setting a target for reducing the gap. Jacqueline highlighted the need for transition from a list of activities to permeating everything we do as an organisation. The Board discussed this issue at length and Jacqueline was asked to prepare a paper for a future Board meeting about how this need might be addressed. Melissa Jacobi, Academic Director for Academic Advising, provided the board with an update on the implementation work for the project including some key progress such as all departments having allocated Academic Advisors to students and invitations to all students to at least one advising meeting. This is alongside a variety of challenges including staff resource, student engagement, supporting students with mental health issues and timetabling meetings. A range of initiatives are being implemented to address these areas of concern, including bespoke training and workshops, and the launch of a Community of Practice to share best practice, to help develop consistency and provide a support network for the advisors. It is being considered if a statement can be developed that universally applies to all student experience at Hallam and not just for undergraduate.